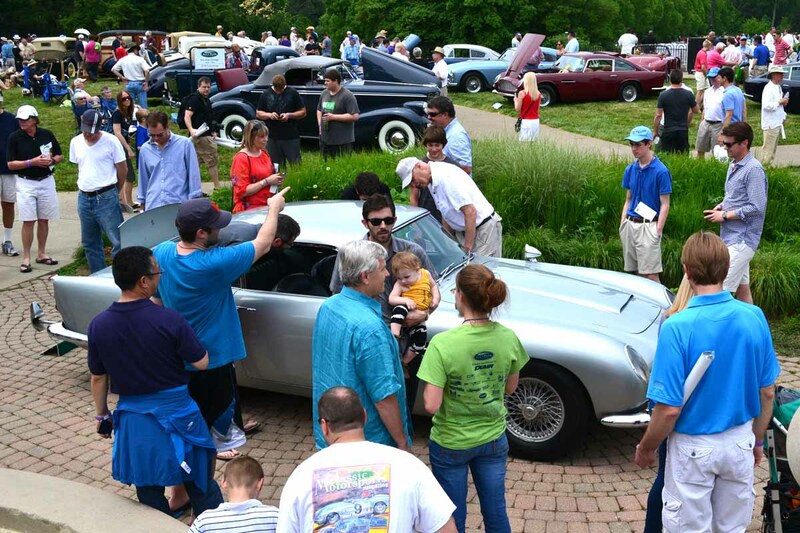 The 1964 Aston Martin DB5 of James Bond fame was recently displayed at the Ault Park Concours d’Elegance in Cincinnati, where it was awarded the People’s Choice Award based on votes received by visitors to the show. 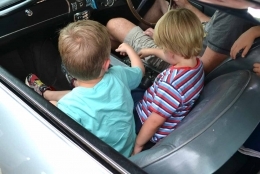 Spectators were treated to an up-close view of the car’s gadgets and armrest control panel as well as the stock features. 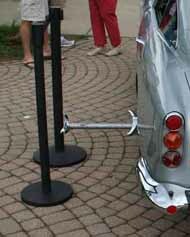 As the photos show, access was not restricted by ropes or other barriers… with the exception of two stanchions to protect visitors from the blades of the extended tire slasher. Yeaggy acquired what many regard as the most famous car in the world in 2010 at an RM Auction in London. 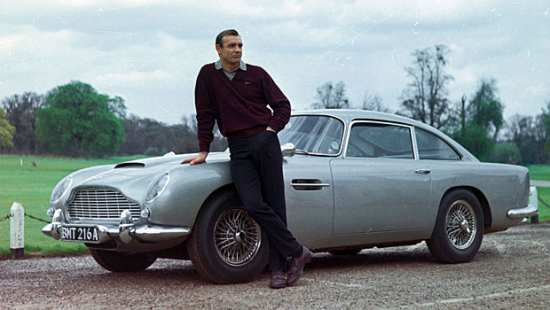 As the lone remaining car driven by Sean Connery in both the Goldfinger and Thunderball movies, it is equipped with a full arrray of semi-functional gadgets. For instance, the machine gun barrels appear (but the bullets do not) and the ejection seat stays put in the car. At the extensively publicized auction, Yeaggy placed the winning bid of £2.6 million, topping the opening – and only other – bid of £2.5 million. Taking into account the obligatory 12% buyers fee, the total purchase came to just over $4.2 million. Some viewers may shudder at our photos of the young passengers expressing their curiosity as they ride with the car’s handler to receive the People’s Choice Award. One of the perks of owning an unrestored collector car is that it’s more suitable as a “driver” than one that has been meticulously restored. This Aston Martin is probably one of the world’s most traveled cars as well. During the 1960s, it was displayed extensively to promote the Bond films, starring agent 007. 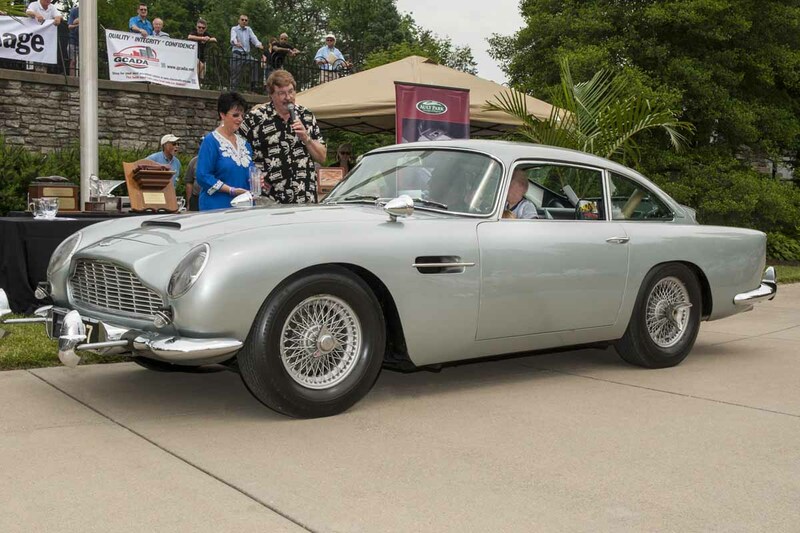 While promoting the 2010 auction, RM Auctions transported the car to Germany, Monte Carlo, Hong Kong and New York. Since his acquisition, Yeaggy has shown the car at several concours d’elegance venues: Pebble Beach, Kirkland, Amelia Island, and Ault Park. It was also featured at the Cincinnati Art Museum last summer as part of an ongoing cars as art display that has featured an E-Type Jaguar and BMW Isetta. James Bond Aston Martin Gallery – Click image to enlarge for slideshow.